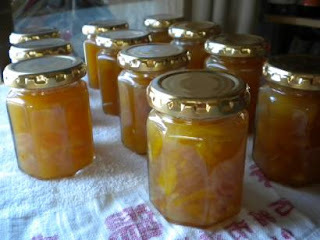 The yuzu ginger marmalade is great. I really love it. But one of the local farmstands also sells apples, and I couldn't resist. Trouble is, I couldn't resist about two weeks ago, and I feared they would decide to leave before I came up with an activity for them. Dreaming of an apple butter using some of the togarashi (hot peppers) from the farm, I went in search of a recipe. I found this tasty sounding one for apple-ancho butter, but I ended up making a version of this one using some neighborhood yuzu (purchased from another local stand not scavenged! 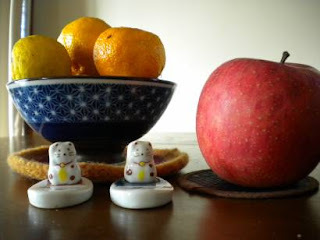 ), the apples, and some ginger. So far, it's been a hit with my crew of tasters, although I am not sure how objective they are when it comes down to it. The yuzu flavor dominates, but perhaps the best part is biting into a little chunk of apple and getting a burst of sweet-sour. A bit of ginger also zips by the taste buds occasionally, which is always pleasant. The apples did not break down much at all, which I'm sure is this type's general behavior. I don't know exactly what type of apple I used, and won't be able to find out for at least another day. (The area stands are still closed up at the moment to celebrate the holiday.) We love it as an eating apple - a nice balance of sweet and tart with good texture - and in our oatmeal. Wash and dry the yuzu. Cut in half and slice as thinly as possibly. Remove seeds. Pop the yuzu in the pot and pour the 3 cups of water over it. Peel the apples, core, and chop coarsely. Add the apple to the pan as you go and be sure to submerge them. (It keeps them from discoloring.) Bring the apple-yuzu mixture to a boil and then simmer covered for 30 minutes. Turn off the heat and stir in the sugar until it is dissolved. Bring it to a boil again, and then simmer on medium-high heat uncovered for roughly (see notes below) for 45 minutes. Stir regularly to monitor thickness and prevent burning. When thick enough (see notes below) ladle into hot jars, and process for 10 minutes. *Otoshio is the Japanese formal way of saying 'year', and it's part of the phrase 'Yoi otoshio!' - 'I hope you have a happy New Year!' - that everyone says until 12:01am on January 1st. Yuzu chopping - I cut the yuzu in half, sliced it thinly, and then cut those long slices in half. In the yuzu-ginger marmalade I did more vigorous chopping, but on a whim did minimal chopping for this batch. It seems to not present a texture issue, and it cooked up just fine. Seed Removal - My philosophy is to remove some at the initial cutting stage, but look for the majority as they show up later during the cooking process. I'm loitering by the pot anyway to stir and test thickness and generally fret, so I just spoon them out at that time. Some still make it through, but it doesn't really matter if you ask me. And my tasters haven't complained (to me) yet. Boiling and Simmering - The original recipe didn't specify covering or uncovering, but I'm including it here. It may depend on the kind of apple and/or citrus you use, of course. Keeping on eye on what's cooking is pivotal here (as mentioned in this great Food in Jars post) as always. Apple - Often used as a source for homemade pectin, my impression was that this apple made for a more even syrup base than my previous batches of marmalade possessed. I rather like how it turned out - a bit more jam-like than chunky marmaladeish - texture-wise, and am thinking about how to achieve this in subsequent creations. Timing - The second round of boiling and simmering went slightly untimed. My favorite spouse left on a quick errand with the iPhone in his pocket, and I didn't discover this fact until I went to see how much time was left. Instead, I just checked the thickness and decided based on that when to go for it. Made this with granny smiths, it is blue ribbon worthy. Your recipe was easy to follow and I was careful not to burn it. Right away had some on walnut wholegrain bread. Heaven. Many thanks for sharing your expertise.